A ship loader & unloader is a huge machine utilized for stacking mass strong materials like iron metal, coal, composts, grains as well as material in packs into ships. Ship loaders & unloaders are generally utilized as a part of ports and breakwaters from where mass materials are sent out. It for the most part comprise of an extendable arm or blast, a belt transport, a tripper to hoist and exchange item from a source transport or feeder, and a versatile structure to help the blast. It is normally mounted on rails and here and there on tires and can move keeping in mind the end goal to have the capacity to achieve the entire length of the ship. The blast likewise can move front and back, here and there by isolated drives so it can fill the entire broadness of the hold and adjust to the boats expanding draft while it is stacked. At the release, an uncommon extending chute, with turning, rotating spoon, encourages even and finish filling of the holds. Ship loaders & unloaders are worked in limits from 1,000 to 15,000 TPH (tons every hour). The tallness of a ship loader can be in abundance of 20 meters and the blast can reach out to a length of more than 60 meters. Transparency Market Research (TMR) has published a new research report providing a comprehensive overview of the market in terms of global and regional perspectives. Certain important facets such as drivers, inhibits, trends, information about the name of the companies, their strategies, product portfolio, and key insights on the various segments have been provided in the research report. According to TMR, the global ship loader & unloader market is expected to witness a meagre CAGR reaching a valuation of over US$66,950 Mn by the end of the forecast period. On the basis of region, the global ship loader & unloader market has been segmented into Latin America, North America, Europe, Asia Pacific excluding Japan, Japan, and the Middle East and Africa. Among these, Europe is expected to emerge as the leading region in terms of demand and consumption of ship loader. The region is expected to reach a valuation of over US$17,800 Mn by the end of 2026. The growth of the region can be attributed to the rising sea trade from in countries such as the U.K., Spain, Russia, Italy, France, and Germany. The ongoing construction of ports and the need for port material handling equipment that is used for the loading and unloading of bulk cargo is one of the core factors that is expected to trigger the growth of the ship loader & unloader market in Europe. 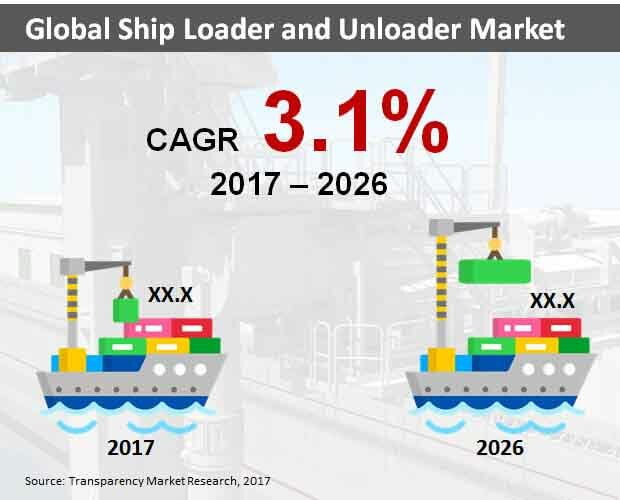 Based on bulk type, the global market for ship loader & unloader has been bifurcated into dry and liquid with dry leading the market through the forecast period. The use of ship loader & unloaders more in the dry bulk type other than liquid because they are easy to carry and are hassle free as well. With rivalry among the market increasing along the lines of product differentiation, the market is likely to witness touch competition. The companies operating in the market are FLSmidth, AUMUND Group, SMB Group, ZPMC, Sandvik, Buhler, VIGAN Engineering S.A, NEUERO, EMS-Tech, AMECO, and Xinapse Systems Ltd., among others. A new market research report has been published in the repository of Transparency Market Research on ship loader and unloader. The report offers incisive insights on the chronological growth course of the market along with the present and future growth prospects present in the market. The report offers an exclusive analysis of the global market along with regional and segment based insights. The report offers an entire summation of the market including an official abstract that draws out the centre examples progressing in the market. It furthermore discusses on a couple of facets, for example, drivers, obstacles, and prospects that have been found in the global market. It also acquaints readers with figures related to volume, value, and development rate of the market from a growth point of view. With respect to market breakdown, each segment is analysed and presented in the report. It also gives an evaluation in light of the market circumstance, and moreover presents a value chain analysis of the products and applications in concern. A year to year progression of the market has likewise been offered in the report for the reader to be particularly aware of the changing scenario of the market. The market study conveys an outlook on the engaged rivalry scene of the overall ship loader & unloader market. It features the competition prevalent among the present vendors in the market and also puts weight on the future circumstance of the market. The profile of the players is based on a SWOT examination sought down by company viewpoint, product portfolio, strategies, finance related information, and year-to-year projections. The organizations have been explored minutely covering their key developments, innovations as well as mergers and acquisitions and agreements with other prominent organizations. The reports made by our industry analysts are dependable and have been researched and authenticated from several primary and secondary resources. What makes us unique is the fact that along with presenting an analysis of the market’s historical and present scenario, we also present a forecast review of the market for the benefit of our reader. The presentation is unique in the form of various charts, tables, and diagrams. Every bit of information present in the market research report is unique. Expert opinions are also present in the report that can be directly used by the readers to make future decisions.